Yes, I am still here folks…between the busyness of the holiday season and being a little under the weather, haven’t really been able to do any crafting of any sort. As such I’m searching for my mojo these days, so please bear with me. 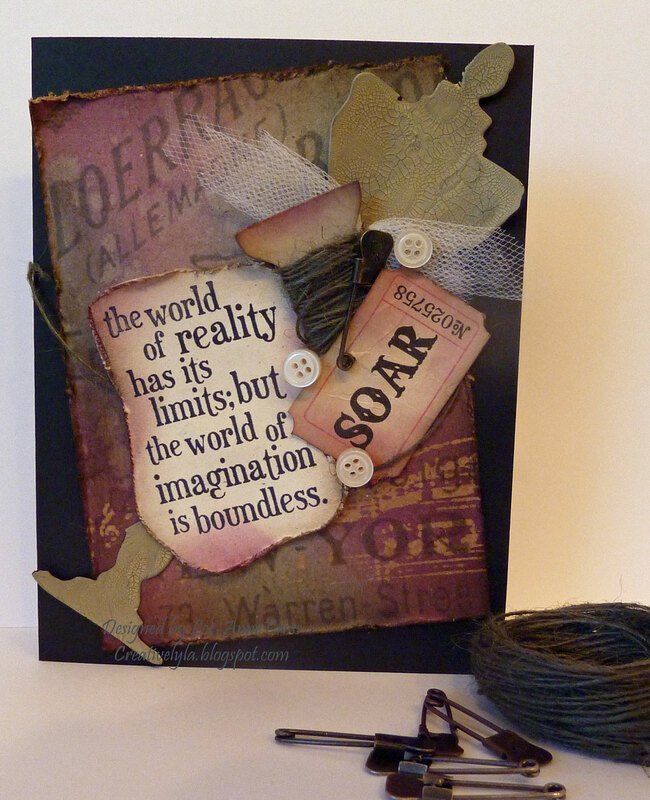 After doing several of twelve tags of Christmas, I was enamoured with all things Tim Holtz and as you’ll see today, most of the items used are indeed Tim’s. I started with a standard A2 card base in black. The background has been created by inking a piece of Kraft Resist with Tumbled Glass and Seedless Preserves Distress Ink. Next I sprayed some water into my hand and flicked it across the paper. The water gives a splotchy sort of look. Then, I die cut the dress form in black and covered it with a layer of Antique Linen Distress Ink. Once it started to dry, I finished drying it with my heat gun and then inked it with a little Walnut Stain Distress Ink. The spool is was also die cut and inked, then wrapped with linen thread in a dark green. A piece of tulle has been gathered up and glued to the dress form, followed by the spool, a tag/pin, then sentiment piece and finally some little buttons. The tag and the sentiment piece have been distressed with a distressing tool and inked. Wishing you all a very Happy New Year and peace, happiness and prosperity in 2012! This is one encouraging card, Lee-Anne. I love the sewing elements and the gentle hint to 'soar'. Hope you are back in the pink of life!